Women who want to create the beautiful bust that will accentuate their physique can do so at Foothill Cosmetic Surgery Center, which serves Glendora and surrounding areas. There is a very specific goal that our expert physician keeps in mind when planning and carrying out the breast augmentation procedure, and that is a natural appearance. Biochemical changes that come with age. As the skin and underlying tissues age, they are less supported by vital substances such as collagen and elastin. The less elastic the skin, the more breasts may change. Breast tissue has weigh to it, so women with larger breasts, in particular, tend to notice changes in the shape of breasts as gravity pulls downward. Changes to weight will affect breast tissue in most women. As volume increases and decreases with weight gain and loss, shape follows suit and breasts may become deflated in appearance. One of the major factors that contribute to changes in breast tissue is pregnancy and breastfeeding. Women affected by changes to existing breast size and shape may be best served by a breast lift in combination with breast augmentation with implants suited to their overall body proportions. Our patients benefit from a precise technique through which breasts can be lifted and filled out beautifully, with results looking natural for many years. Breast augmentation is the procedure of filling out the breasts to a more satisfying shape and size. There are four different approaches that may be taken to achieve the desired result, and a number of options for implants themselves. During the consultation visit, patient and doctor take the necessary time to discuss concerns with current size and shape and the extent of augmentation that will best suit the body. Our experienced physician seeks the most natural aesthetic for each patient, one that will boost confidence. In most cases, implants will be situated beneath the muscle tissue beneath the skin. Through this method comes the most natural appearance. Due to the tightness of muscle tissue, medication is administered during the augmentation procedure to aid in a more comfortable recovery. Most women feel mild to moderate discomfort as the muscle stretches and are able to resume normal (approved) activities within a week after their procedure. Exercise may be resumed after a few months, giving implants ample time to settle into position. Patients of Foothill Cosmetic Surgery Center love the results achieved with breast augmentation with or without the lift procedure. Using very careful technique, our physician works in a way in which scarring is very minimal. You deserve to feel confident in the shape of your body. 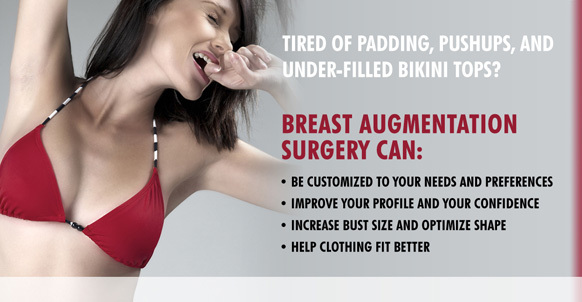 Learn more about breast augmentation in the Glendora area by calling Foothill Cosmetic Surgery Center.